IT WON’T STOP RAINING. MAKE IT STOP. At least while I’m writing this, it’s raining yet again. It’s like monsoon season in south Texas. I mean, it’s better than the alternative which is burning hot. But it just makes it difficult to, you know, actually do things outside. Anyway, in my apartment I can pretend it’s summer by spraying myself with all sorts of coconut things and wearing bronzer and blue eyeliner. 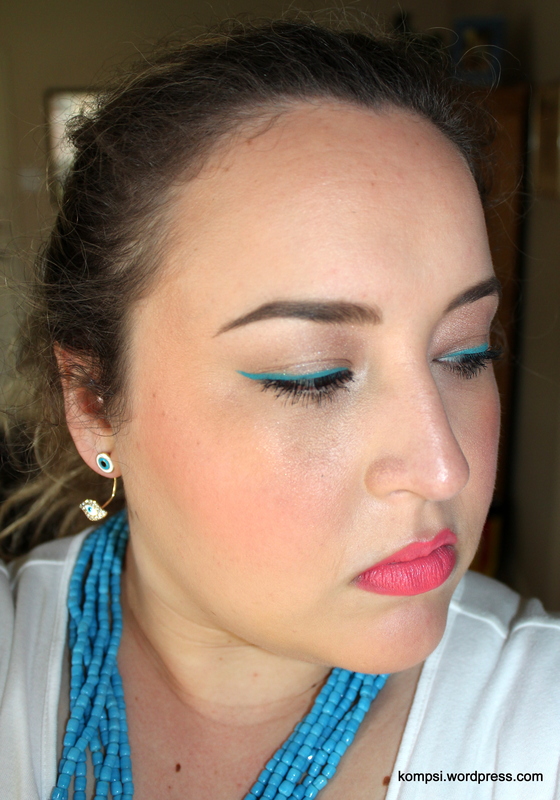 Turquoise and coral! It’s a natural for summer. Bath & Body Works was having their semi-annual (I think?) 75% off sale and I picked a few things up. Some coconut/beach scented aloe gel lotion (it’s a hybrid type thing, really moisturizing), a couple of shower gels, a beachy/coconut scented candle (Copacabana Beach) and Plumeria body splash. Recently, B&BW re-released a bunch of their classic scents from the 90’s and early 2000’s, such as Pearberry, Juniper Breeze, Country Apple and Cucumber Melon. I ended up with Plumeria because it was the only one I could see myself wearing as a 30-something. Also, it layers well with coconut. I know I’m probably over-scented right now but whatever. This is why I live alone! Anyway, I love this look in that it’s striking but very simple and feels very light on my face. True Match Lumi is a light foundation on it’s own but I wanted something more in between a foundation and a tinted moisturizer, which is why I sheered it out with MAC Fix+. To do that, I just pumped a small bit of foundation or concealer on the back of my hand, spritz some Fix+ and mixed it with my finger. I then applied it to my face and buffed it out with Real Techniques Expert Face Brush. I use this brush to do both my foundation and concealer. For powder, I lightly buffed it on, just enough to reduce shine and to set it. I was thisclose to using a bunch of eyeshadow, but decided to just keep the Potion Primer as the base. I think it looks cleaner and keeps the focus on the blue without looking so made up. I hope ya’ll are having a great summer! 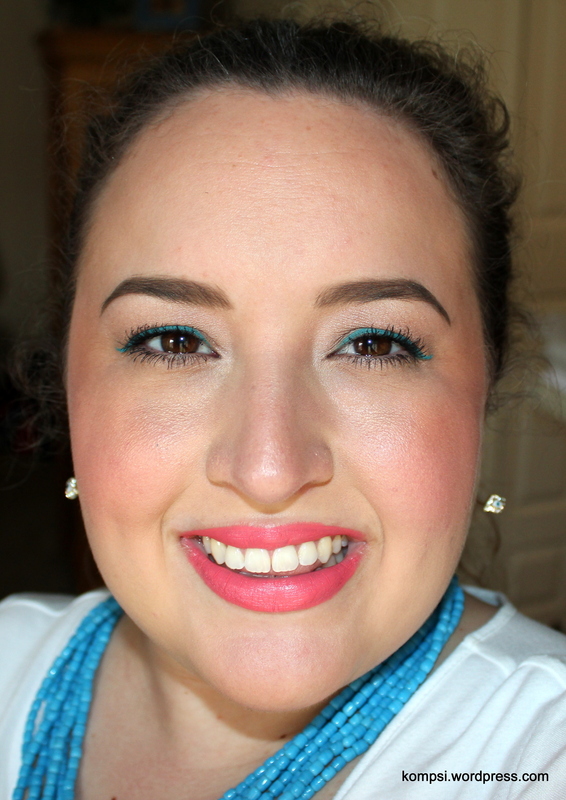 I really enjoy a pop of color like this during summertime, though I am usually not as brave as you are and limit it to my lower lash line. 1. Your favorite frozen treat? 2. How are you with DIY home projects? 3. Have you ever had to live next to noisy neighbors? 4. Sweet, sour or savory? 5. Has anyone ever read your diary? Thanks! I do the lower lash line sometimes too. I think with my hooded eyes, it’s a little easier to be colorful on my lids because you can’t really see anything on them unless I blink!